Two stouts with a flavorful but low-alcohol punch. Utah's low-point beers can be a tough sell for some. Many beer enthusiasts claim that they're too weak in body and flavor to be worth their hard-earned dollars. In some cases that might be true, but in the realm of stouts, great things can be achieved with very little effort. Here are some nice examples of low-point stouts that have the necessary oomph without the hammering effect. 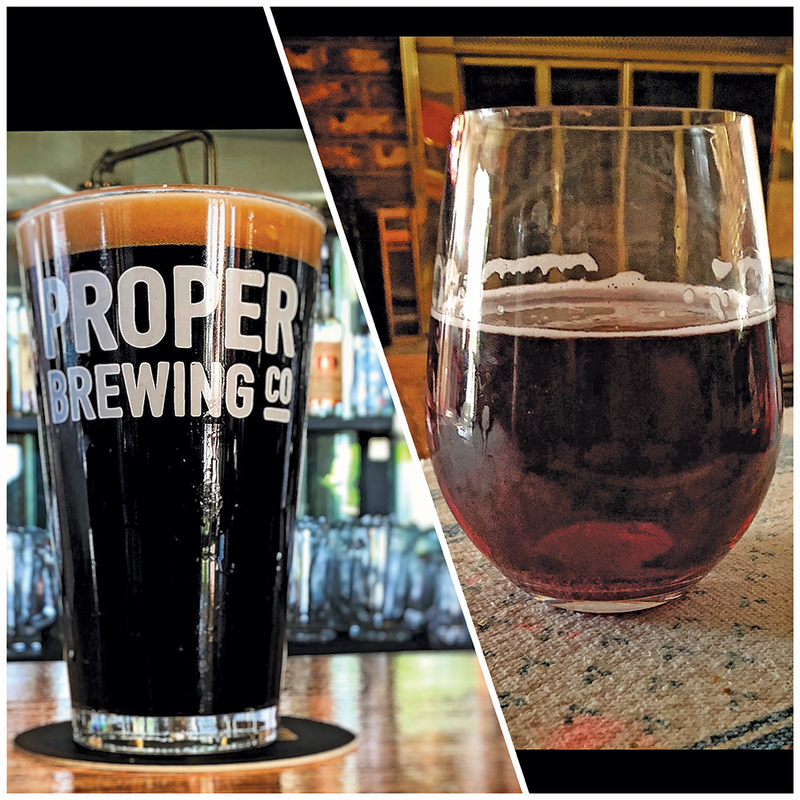 Proper Brewing Co. Foreign Gentleman Coffee Stout: Predictably, the beer is a solid black color with a gorgeous tan-ish head, akin to coffee froth, with good head retention. If you love the way coffee smells, you're in for a treat. Wonderfully rich coffee smells immediately seize my senses—subtle roast, luscious java and no bitterness. And boy, is it pungent, promising incredible depth of flavor. As promised, coffee is easily the star of the show. This brew delivers bold, diverse coffee character, but believe it or not, the coffee isn't the prime motivator of this beer. Belgian yeast spices creep in mid-palate, bringing complex flavor textures that not only play off of the coffee, but with the roasted malts and the Ovaltine sweetness. This beautifully balanced coffee stout provides a sleek, silky mouthfeel and magnificent softness on the palate; its soft texture counters any coffee harshness, while subtle chocolate malt accents balance out any bitterness. Many coffee stouts suffer from too much acidity; this is not one of them. It's medium-bodied, with perfect thickness and heft for a 4 percent beer, plus near-ideal carbonation. Overall: There are plenty of interesting flavors happening here, not just coffee. And considering the fact that co-owner/head brewer Rio Connally isn't a huge coffee fan makes this beer even all more impressive in its execution—really remarkable stuff from a brewery I'm constantly looking to try more of. 2 Row Brewing Roll Out Stout: A standard pour reveals a color that is opaque black and toes the line between flat and shiny. On top, the medium-brown colored head yields two fingers worth of active and audibly fizzy foam. The minimal-at-best retention gives way to an uneven splotchy veil of lacing and a thin collar. It's not a bad looking beer by any stretch of the imagination. The nose is big and enticing with sweet milk chocolate along with notes of lightly roasted coffee beans. A hint of lactose along with raisins and dark fruits begin to emerge, rounding out some of the roastier aspects. Everything one should expect in an oatmeal stout appears in wonderful balance, with nice layers of depth and complexity. Flavors of lightly roasted coffee are first to the party; no actual coffee is present, as far as I know, but it makes for an interesting start. Next, a slightly sweet malt component emerges, creating milk chocolate flavors that immediately start to fade. As the sweetness fades, roasted malt asserts itself, churning up dark fruit notes along with bitter chocolate that will carry you into the end. This one is on the medium side of light-bodied, with crisp carbonation, and a similarly smooth and creamy taste like the Proper Coffee Stout. Overall: A rock solid oatmeal stout loaded with character and complexity. Its 4.0 percent ABV is right on target for the style, and all the components work well together. The end result is a stout that seems to be a bit more than the sum of its parts. Foreign Gentleman is a seasonal offering from Proper, available right now at its Salt Lake City brewery (857 S. Main). Roll Out Stout is also a seasonal, and can be found at 2 Row's Midvale brewery (6856 S. 300 West). Don't forget your growlers, so that you can take some home. As always, cheers!